Policy, economics, local food systems, urban agriculture, innovation and entrepreneurship were the star topics at Seedstock’s 3rd annual Sustainable Agriculture Innovation Conference. The conference drew the attention of the Los Angeles Times, which covered the tour for their City Beat column. 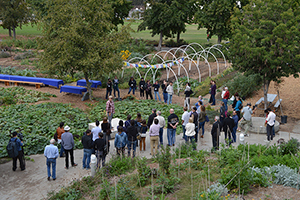 Participants at the two-day event, held November 11-12 in Los Angeles, toured a rooftop farm atop a storied private club in downtown Los Angeles, an urban farming operation at a Pasadena high school, a food production business incubator in the Lincoln Heights neighborhood, and an aquaponic shipping container farm in the city’s arts district. A.G. Kawamura, former secretary of the California Department of Food and Agriculture, and Robert Egger of L.A. Kitchen delivered the two keynote addresses. Kawamura spoke of not only what needs to be fixed in agriculture, but also of the many things that agriculture has done right to provide a consistent supply of safe and healthy food. He said, “food is a privilege, not a right,” stressing the importance of sustainability, especially in times of extreme drought. Egger spoke of the power of food, and told the story of how L.A. Kitchen will not only provide food for the poor, but opportunities, which are far more important. Michel Algazi of Food Centricity, Erika Block of Local Orbit, Dwight Detter of Whole Foods Market and John Mesko of the Sustainable Farming Association joined Kawamura on a panel discussion about how to foster an economically robust local food future. Block emphasized the importance of following a map, rather than a script, to remain dynamic. “This allows for flexibility,” she said. Algazi promoted aiming for a 40-50 percent gross margin each month. “Don’t undercharge,” he advised. Strong economic health in any sector is difficult without good policy. Speaking about policy to bolster local food systems were Kimberly Kessler of the UCLA Resnick Program for Food Law & Policy, Clare Fox of the Los Angeles Food Policy Council, Mark Glassock of Los Angeles Neighborhood Land Trust and San Buenaventura City Councilmember Carl Morehouse, who is also the president of Southern California Association of Governments (SCAG). Glassock listed three important issues that demand strong urban agriculture policies: displacement, blight and water. He pointed to Detroit as a great example of a city that is working hard to address all three challenges at once. Profitability and the social value of urban agriculture was addressed by a group of panelists including Sasha Kanno of Long Beach Local, Nurit Katz of UCLA’s Sustainability Office, Rickey Smith of Urban Green, Mud Baron of Muir Ranch at John Muir High School and Dan Allen of Farmscape. If agriculture is going to thrive in urban environments, much of the production will need to take place in controlled environments, especially in cold-weather climes. A group of panelists, including Eric Ellestad of Local Roots, Colin Archipley of Archi’s Acres, David Rosenstein of EVO Farm, and Erik Oberholtzer of Tender Greens talked about the commercial viability and scalability of hydroponic, aquaponic and and various other controlled environment agriculture systems in urban environs. One of the keys to success in hydroponics and aquaponics is to build strong relationships with chefs, as well as marketing to people who don’t think much about food, Rosenstein said. Archipley says, customers value seeing the face of the farmer who produces their food. The final panel, comprised of Nicola Kerslake of New Bean Capital, Rob Trice of Better Food Ventures and The Mixing Bowl, Robert Tse of USDA Rural Development and Wilton Risenhoover of Tuition.io and the UCLA Venture Capital Fund, discussed innovation, entrepreneurship and investment in local food. Trice said it is important to get sustainable and urban farmers to think more like businesspeople. Tse takes this a step farther, because the existing agriculture business model assumes a large supply of low-cost, unskilled labor. “This is changing,” he said, warning of a significant agricultural labor shortage in the years to come. Precision agriculture is the future, Tse said, and drones will play a huge role in agriculture in that future.